A great person’s place in history is defined over time. Rarely is an exceptional individual truly recognised for their achievements in their own time. In fact death is the catalyst that promotes the process towards historical greatness. Throughout his life, Sir Winston Churchill was both revered and vilified. He spent much of his career alone in a ‘political wilderness’. In 1945 he was hailed by the British public as a national hero and saviour of the nation (if not the world). Yet later that same year he was unceremoniously ousted from his role as Prime Minister at a national election. From that moment on Churchill slipped slowly into retirement and was mostly lost from public view. Since his death his stature has grown such that today many say that he was one of the greatest men (if not the greatest) in all world history. When the mentally tortured Vincent Van Gogh died in 1890 he was living close to poverty. During his lifetime he often lived alone and had trouble selling his unique works of art. Today he is recognised as one of the greatest artists of all time and his works are some of the most popular and expensive of all. It seems to be a common story with great artists that they often live and die in poverty but after their death achieve immortal fame. In the world of cycling the same rules of greatness apply. All of us recognise certain racers from the past who, for different reasons, stand out as almost mythical figures. Perhaps the Italian ‘tifosi’ have the best term to describe these special characters - Campionissimo (champion of champions). 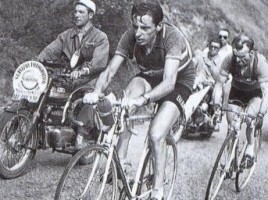 The most famous of all Campionissimo is without doubt Fausto Coppi. His racing exploits are legendary. 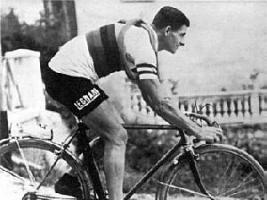 His ongoing rivalry with Gino Bartali fuelled intense passion throughout Italy. During those years the nation was simply divided as ‘Coppi-ista’ or ‘Bartali-ista’. There was no midway, you firmly supported one champion or the other. When Coppi died tragically at the age of 40 from malaria (following a hunting trip in Africa), Italy was thrown into a period of deep and sincere mourning. Almost overnight Coppi became considerably more than a Campionissimo and even today his legend continues to grow in stature. If Fausto Coppi was greatly loved in his time, the same cannot be said of a French version of Campionissimo, Jacques Anquetil. The first rider to ever win the Tour de France five times was viewed as an ice cold calculator with aristocratic pretensions. He made no secret of the factthat the only reason that he raced was to earn large amounts of money. He used his incredible time trailing capabilities as a foundation to numerous victories. He also built teams around him that could support his Grand Tour objectives. 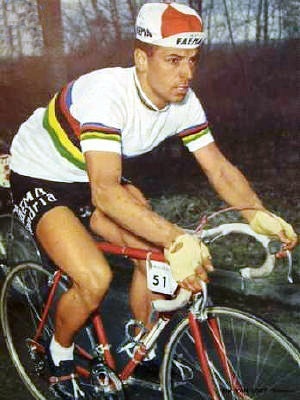 However it was his ongoing rivalry with Raymond Poulidor that absolutely cemented his image in the eyes of the public. 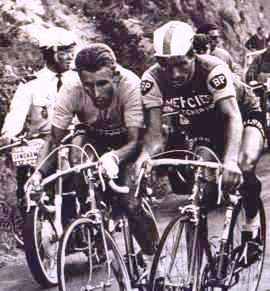 The story of the 1966 Paris-Nice where Anquetil, as always, would not allow Poulidor to win any race in which the two of them were competing. On the last stage of the race Anquetil ‘turned himself inside-out’ to grab victory from the hapless Poulidor. You can read that epic story in more detail here: PezCyclingNews. In the eyes of the French public Poulidor was their ‘darling’ and Anquetil was the villain. While Poulidor certainly created an impressive list of victories, it was Anquetil who garnered the most illustrious of wins. It was not uncommon for the French fans to deride Anquetil and treat him to a raucous chorus of cat-calls. Interestingly in recent years Anquetil’s place in history is ascending as France increasingly recognises the unique career of this great cyclist. Not all Campionissimo won Grand Tours. Two Belgian names that spring to mind are Rik Van Steenbergen and Rik Van Looy. Essentially one-day specialists these two men epitomise the hardest of all racers. Their legends were born on the gnarled roads of Belgium and Northern France. They devoured the competition and raked up an incredible number of wins in the classics and prestigious races. Van Steenbergen won nearly 1000 races during his long career and Van Looy garnered 379 wins. Two interesting legends of the past are Spain’s Federico Bahamontes and Luxembourg’s Charly Gaul. 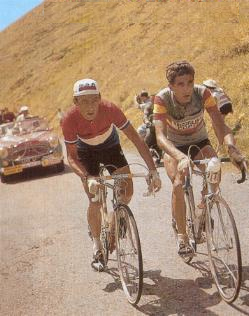 Both were climbing specialists who soared into the clouds of the highest cols leaving their adversaries far behind. Like Coppi, they both created legendary rides that to this day are fondly remembered by their many fans. Both Bahamontes and Gaul were able to apply their climbing skills to achieve overall Grand Tour victories. A clue to their greatness is found in the nicknames bestowed by their legions of fans - The “Eagle of Toledo” (Bahamontes) and the “Angel of the Mountains” (Gaul). What made riders like these stand out? Exceptional athletic ability is a necessary ingredient for any cyclist to succeed at the highest levels. But the Campionissimo have other qualities which make them truly unique. To a person they typically defy common wisdom and have little regard for the political sensibilities of their times. In the cycling world the ‘greats’ usually excel at ANY racing discipline that they choose to compete in. Most importantly they compete on their own terms and dictate races with their manner. In the peloton such a dominant character is often referred to by everyone as ‘Le Patron’. And nobody messes with Le Patron! Where are the modern Campionissimo? In the modern era there are few names that we here at CyclingRevealed would consider as Campionissimo candidates. However, it often takes very many years for someone’s place in history to solidify. Happily Eddy Merckx is still very much with us and his racing record is cited as the most incredible of all time. The scope of his wins from Grand Tours to Classics is unparalleled. He also excelled on the track and at one point claimed the World Hour Record on the track. His voracious appetite for victory was rewarded with the nickname ‘The Cannibal’. On occasion his almost uncontrollable focus on victory even had his own team manager pleading with him from the support car to ease off in fear of ‘blowing up’. Such pleas would be ignored as he continued to massacre his opposition. 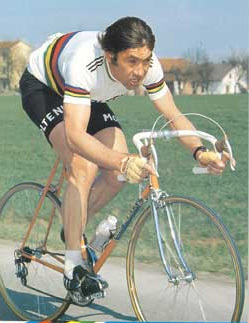 Merckx is undoubtedly elevated into the domain of a legendary and almost mythical Campionissimo. Not historical champions can rise to Campionissimo status. Of other living champions past and present Bernard Hinault will also be treated well by cycling history. A truly hard man in the ways of Van Steenbergen and Van Looy, Hinault won everything of consequence in Grand Tours and the Classics. And it was in his nature to defy convention and pursue victory in whatever manner he chose. Miguel Indurain deserves a big place in cycling history. His case is made as the first Spanish rider to win not only five Tours, but five Tours in succession; he was undoubtedly an impressive rider. But ‘Big Mig’ rode his Tours in almost robotic fashion. He was able to use his immense power to contain his opponents in the mountains and then destroy them all in the time trials. For each of his five Tours his formula to victory was always the same. Beyond the Tour he won two Giro’s and World and Olympic time trials, but his lack of panache and his almost singular focus on his time trial skills are probably not the stuff of a Campionissimo. With each passing year one name that stands out is the tragic Marco Pantani. In his own fashion he truly carved his own way through the peloton. His climbing exploits have already become the stuff of legend. Lovingly known as ‘The Pirate’ by the cycling world, Pantani was an eccentric personality who was unfortunately sucked into the world of drugs by unscrupulous characters. Time seems to be suppressing this unfortunate flaw and it is his colorful personality and ability to defy gravity in the highest mountain passes that could see him join the elite ranks of Campionissimo. The modern fan will immediately name Lance Armstrong as a Campionissimo candidate. However, upon closer inspection Armstrong does not match up to those legendary names of the past. His record is based mostly on one race, the Tour de France. Admittedly he has won seven Tours but the panache of the great Campionissimo of the past was missing. Armstrong turned his team into a corporate style operation where every facet (training, equipment, diet, etc.) was ruthlessly analysed, calculated and planned. Besides his Tour exploits his victories were few and far between. For most of his seven Tours he was cocooned within the protective shield of his team. 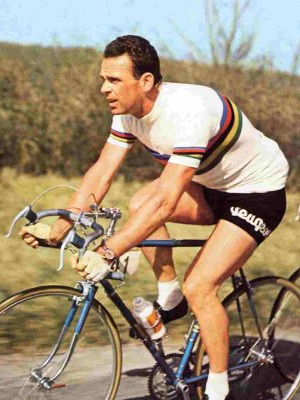 As a result his Tours became predictable and his personal approach void of great attacking riding in the manner of a Coppi, a Merckx or a Hinault. It could be that Armstrong understands this fatal flaw in his legacy and perhaps his 2009 comeback is going to address this fact. If so, then we will be in for some truly great racing! And don’t forget the ladies of cycling history! Rarely are women riders considered in conversations concerning Campionissimo. But two names should be consideered. 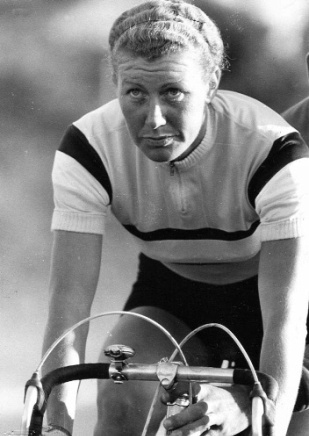 Great Britain’s Beryl Burton was a phenomenal rider during the 1960’s and 1970. 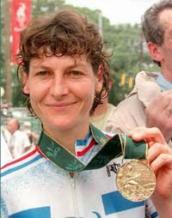 She won the British National time trial championships for 25 straight years. 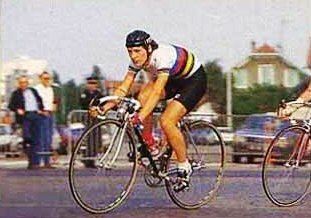 She also won World Championships and many prestigious international races. At the peak of her powers she was briefly allowed to race with the British professional male peloton. When she started to win (especially in time trials) the embarrassment was too much and she was again excluded from the male ranks. The phenomenal Jeannie Longo (France) rode the 2008 Olympics and just a few weeks before her 50th birthday. Still highly competitive and highly feared in the peloton, Longo has a race resume that few (if any) can match. Longo, like Burton, is one of a kind, with a truly unique personality. Their incredible careers and personalities surely make them Campionissimo candidates. Here at CyclingRevealed we have our own list of riders that we believe earn the distinction of Campionissimo. In addition to the names mentioned in this article we would add Maurice Garin, Phlippe Thys, Alfredo Binda, Antonin Magne, Tom Simpson and Sean Kelly. But there are many more that deserve meantion.